Nativity Day is here and to celebrate I am blogging about one of my favourite oven roasted vegetable dishes. 'Swede' or 'Rustabaga' originated as a cross between the cabbage and the turnip. In England, they are regularly eaten mashed as part of the traditional Sunday roast. Often they are boiled together with carrots and served either mashed or pureed with butter and ground pepper. I decided to treat them like sweet potatoes and oven roast them. Seasoned the Swede with the Mangalore special Baffat powder ( see note below), curry leaves, green chillies and tossed it into the oven, baked till soft. The end result was pretty awesome. The outer crunchy spicy surface gives way to a soft, mildy sweet centre thats is yummm! Substitute your regular potato chips with these spicy cubes. 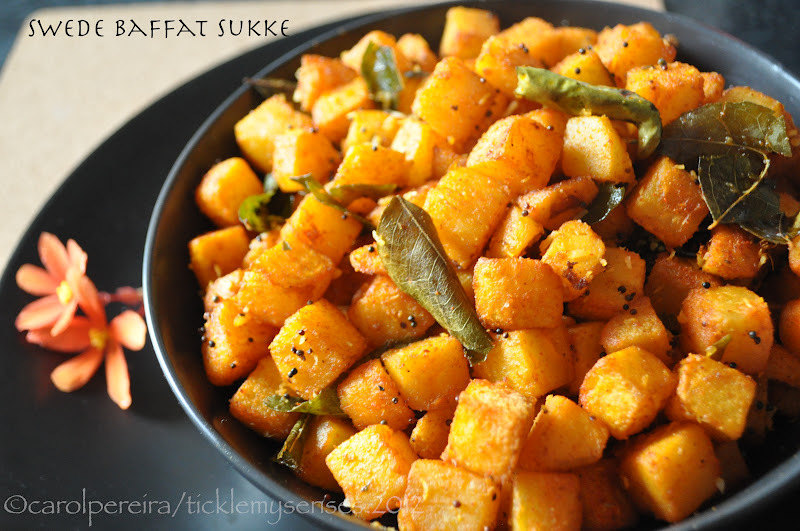 To make Oven roasted Swede with Mangalore Baffat powder. Coconut oil/ any other vegetable oil: 1-2 tbsp or as required. 2. 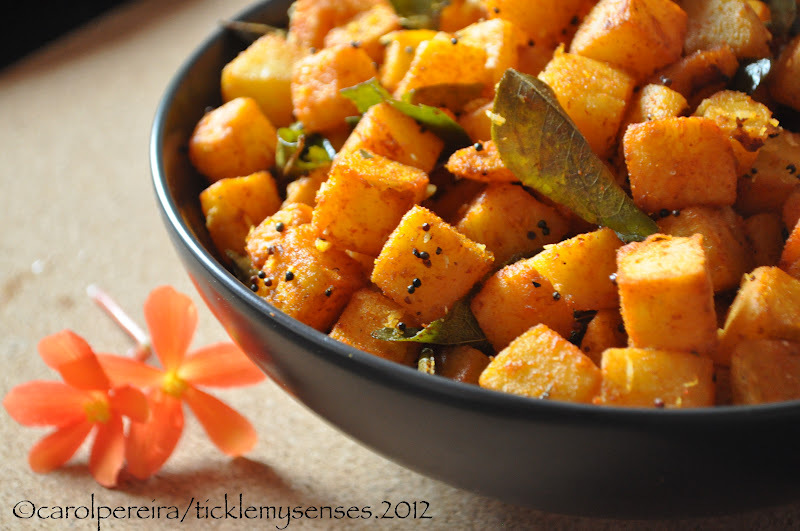 Heat a large wok with coconut oil, when hot add mustard seeds, splutter, add naked urad, curry leaves and green chillies and fry for a minute, add a pinch of turmeric and hing fry for few seconds, then add the cubed swede, stir fry for a minute, sprinkle over the baffat powder/ sambhar powder/ vegetable spice mix, salt to taste, coat all pieces well. 3. Place all the spice coated swede cubes flat on a greased baking sheet, center of the oven, sprinkle over 2-3 tbsps of water and roast for 45-60 minutes or till soft and done. Turn in between 2-3 times. Sprinkle water over swede cubes in between if needed. Taste for salt, adjust. Squeeze over lemon juice if needed, serve hot. Enjoy as an accompaniment to beef/ lamb steaks or grilled fish or traditional rice and daaliso saar. 1. Mangalore Baffat powder can be made at home (recipe here) or can be brought ready made from Konkan Traders, Don Stores or Costa Bakery in Mangalore, India. This powder is so versatile it can be used in various preparations like Dukrachemas/ Pork Bafat Style, Kori Sukka ( Chicken dry style with coconut) , Baffat Chicken/ fish curry and is a good seasoning for vegetables like marrow (Cucumber Baffat sukke) or starchy vegetables like yam, potatoes, plaintains and swede. As an alternative if you cannot find Baffat powder you could substitute with Sambhar powder or a ready vegetable spice powder available in most Asian stores. 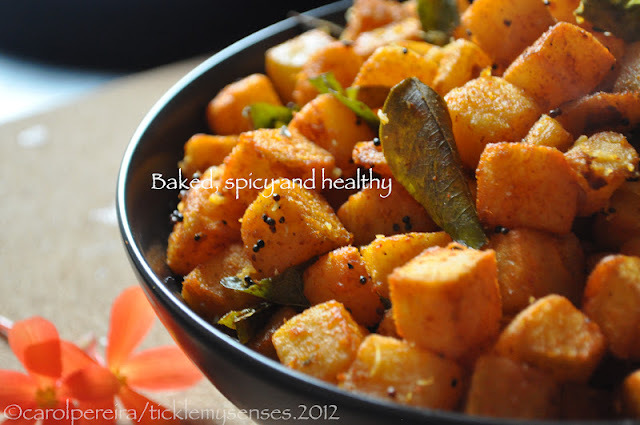 For a milder flavour substitute the baffat/sambhar powder with a sprinkling of 1-2 tsps of Smoked Paprika powder. Just stumbled onto this site when looking for recipes for Nativity. Wonderful Blog! Tell Clement I said Hi! We went to school together at Mysore. I hope you do find recipes here that you will enjoy.